After a long - almost 4 year break, I've decided to get back to the ALDI Spot. 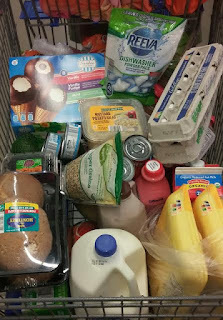 A lot has changed, since I started up the ALDI spot, and while I've continued to blog about our ALDI shopping trips at our frugal family blog Frugality Is Free, I think it's time to get back to real ALDI blogging. We recently moved from urban South Florida, where we had a 20 minute drive to our local ALDI store. We now live in beautiful north east Florida, and we only have a five minute drive to ALDI. With three growing boys ages 7, 10 and 14 plus a little 3-year-old princess, ALDI has been a big budget saver for our family of six. As I talk with people in our new community, I have come to realize that there are still a lot of people who have not learned about what a money saver ALDI can be. This is why I'm going to start blogging about our ALDI savings and experiences again. Glad to see you back sharing budget saving tips thru shopping at Aldi.